I realize I'm a week early to be sharing my annual Halloween theme post but I can't help it. I love Halloween so much that I like to savor it for as long as I can, leading up to the big day. Many of you already know that I have a fascination with all things Gothic (vampires, crows, werewolves, bats, the moon, and the color black). So, what I did this year was take a photograph that I published on last years Halloween post in which I had edited myself into vampire, and then I overlaid that photograph onto each of these photographs. 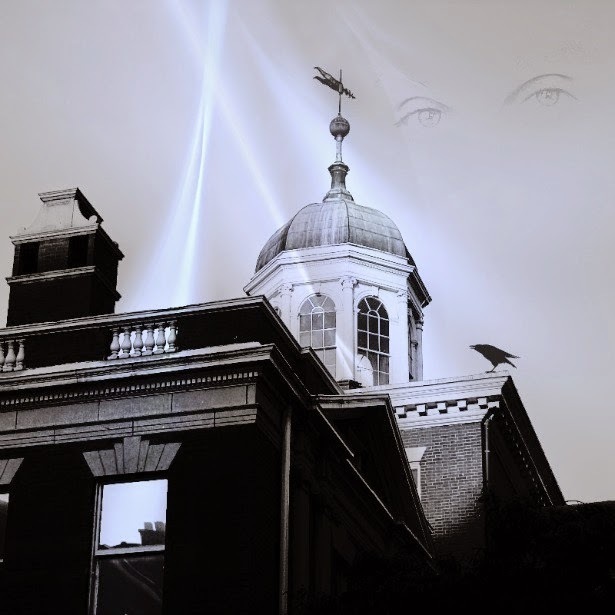 I also added a few other editing effects to embellish a supernatural and ghostly feel. A few of these photographs you may recognize from past posts over the years, however, most of them are new. If you would like to hear sounds effects (thunder and rain) while scrolling through the photographs to add more drama, please click on the video below before viewing. I think number 3 is the spookiest. I had trouble finding you at first in the last one, but then I laughed because that one reminds me of an ad in a window. Nice work on all! Those eyes followed me everywhere, eerie...lol. Loved the last picture, you fitted so well in that small pane. I don't have much time for Halloween because where I live it's an occasion to upset people by knocking on doors in the middle of the night or threatening people with eerie things. Seems to me that people have lost the idea of just enjoying themselves. I don't begrudge others enjoying it though so I hope you have a good one and remember to tell us all about it. Ron, these photographs are awesome! And I love how you added the sounds effects (which I did click on) while viewing. You always put so much into your posts. I also love the crows between each photograph. I can't even decide which ones of these I like the most because they're all great. #'s 3, 7 and 8 are amazing. This year I'm going to a Halloween party at a girlfriends house with some friends. My costume is Morticia Addams from the Addams Family. I'm dressing all in black and my makeup will be pale with a dark red lipstick. I even have a long black wig. "I had trouble finding you at first in the last one, but then I laughed because that one reminds me of an ad in a window." HAHAHAHAHA! You're right, it does!!!!! I initially positioned the photo of me in the basement window, however I couldn't get it to overlay like I wanted.
" Loved the last picture, you fitted so well in that small pane." Thanks :) I had initially tried to position it into the basement window, however, I could get it to overlay properly - it wouldn't blend. "...it's an occasion to upset people by knocking on doors in the middle of the night or threatening people with eerie things. Seems to me that people have lost the idea of just enjoying themselves." Yes, you're absolutely right. Sometimes Halloween can turn into a ruckus, especially nowadays. "I hope you have a good one and remember to tell us all about it." We may be dressing up at work this year, so yes, I will be sure to share about that if we do. Have a lovely weekend, dear lady. And thank you for stopping by. Thank you :) I added the crows between the pictures as a last minute thought before I posted. "My costume is Morticia Addams from the Addams Family. I'm dressing all in black and my makeup will be pale with a dark red lipstick. I even have a long black wig." OMG...that's sound like fun! I love the Addams Family. And I bet your costume is gonna be faaaaabulous! These are fantastic, Ron! Each one of them has a different feel but they all have a spookiness about them. # 3 is so creepy. It looks like a sketch on the wall. And I like the single yellow window in #7 and how it matches the color in your eyes. Love what you did with the final photograph and the shadow of the crow on the door! REALLY nice photo editing, dude!
" # 3 is so creepy. It looks like a sketch on the wall." I took that shadow photograph about a year and a half ago when I was in Florida visiting my brother and it's been on my computer since then. I didn't know what to do with it until I decided to use it for this series of photographs. And yes, it does look like a sketch on the wall, you're right! Thanks so much for stopping by, buddy. Have a grrrrrrreat weekend! Holy crap! The eyes of Ronnie are everywhere! I'll be sure to draw the shades when I take a shower! Seriously, though, Ron, these photos are great! 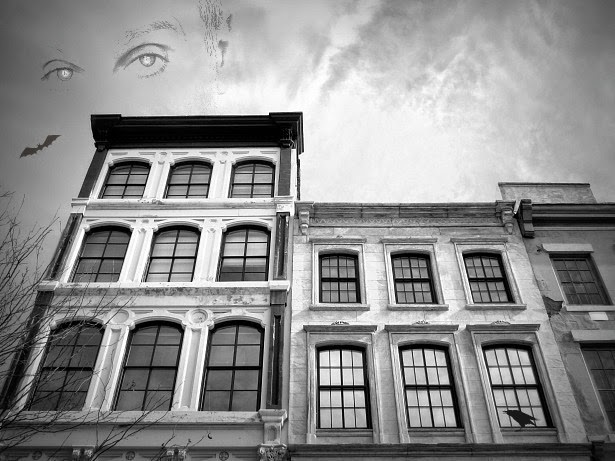 I especially love the apartment building image with the single light and the moon...and those crafty eyes! The office building photo is very cool, too. And those eerie sound effects put me in the perfect mood--to hide under the bed!! Very skillful editing - I have to learn how to do that - I've never been able to figure out 'layers' . I really like the last one best. I love these shots! Black and white it such a wonderful medium especially this time of year. Love the detail in the architecture. I used to love to dress up on Halloween for the school parties...was always a witch with an elaborate face painting job. Not much opportunity to do that anymore. It's odd that I like Halloween....but hate horror movies! Hope you have fun this year wherever you haunt! Way cool and utterly creepy! They're all fantastic; I can't pick a favorite. I did enjoy the sound effects (thunderstorms can be awesome) from the clip as I browsed through the photos. Awesome photos, Ron, and it was a treat looking for your "eyes" in every one! The black-and-white medium really showcases Halloween and the spooky stuff. 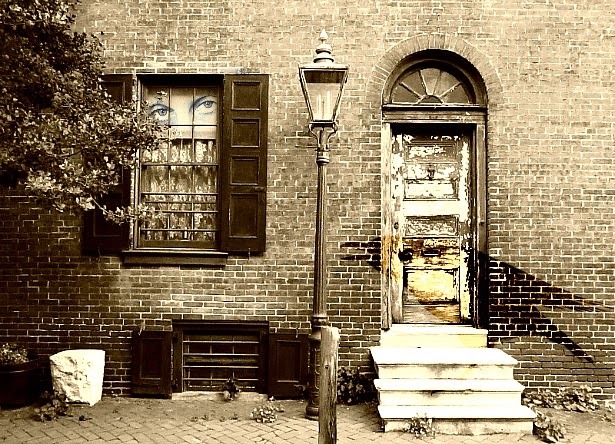 The house in #4 is amazing and looks appropriately haunted; the clarity in #5 is outstanding, and the solitary golden windows in #7 are particularly intriguing. I'm not a big fan of bats, having had more than one mistakenly get inside our house, though! Ron - I can confidently say you have a demonic presence about you in these photographs. I mean that as a compliment, of course. 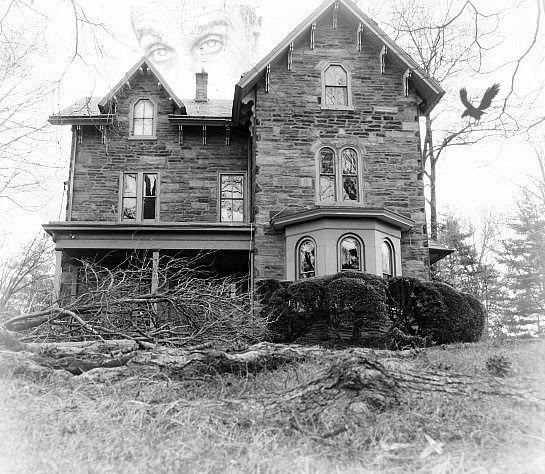 Great job making these already spooky photos even creepier! Thank you, Pearl :) I added the sound effects last night before I posted. I originally had just a sound track, but I couldn't get it to embed on my blog so I found this clip on You Tube. Have a lovely weekend, m'dear! And thank you for stopping by! Thank you, Grace :) I did this editing over at picmonkey.com. I don't know if you've ever used that website for editing but it's has a lot of cool effects. I've been using it for about 3 years now. Have a faaabulous weekend, my friend. And thanks for stopping by!
" I'll be sure to draw the shades when I take a shower! And those eerie sound effects put me in the perfect mood--to hide under the bed!!" Bwhahahhaha! Rob, you crack me up!!!!
" 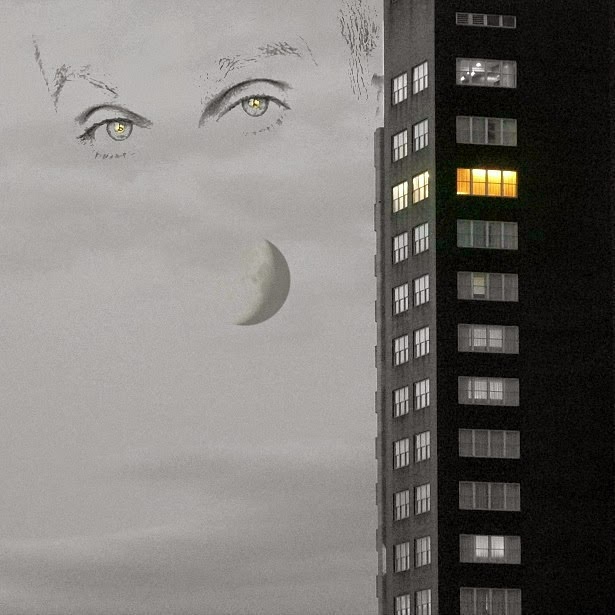 I especially love the apartment building image with the single light and the moon...and those crafty eyes!" I took that shot from my apartment window one night and used the zoom lens on my camera. Later, I added the effects. "! Halloween isn't one day, it's a season, so I'm glad you're spreading the spookiness!" You are so right, it is a season and I'm savoring every minute of it. Thank you, Suzi :) And I'm glad you enjoyed the sound effects. I added those as a last minute thing last night before I posted. Have a faaaaaaaabulous weekend, my friend. And thanks so much for stopping by! "Black and white it such a wonderful medium especially this time of year." I agree! Some of these I converted into black and white and some of them I shot IN black and white.
" I used to love to dress up on Halloween for the school parties...was always a witch with an elaborate face painting job." OMG, when I was a kid Halloween was such a big deal that I would plan my costume a MONTH in advance - HA!
" It's odd that I like Halloween....but hate horror movies! I don't like horror movies either, but I do love scary movies. Ones that are more suspenseful, but not gory. "The black-and-white medium really showcases Halloween and the spooky stuff." I agree, black and white really showcase spooky stuff. Some of these I converted into black and white and others I shot IN black and white. The house in #4, I shot last Spring while I was in Chestnut Hill, PA. But then I edited it to make it a bit more scary-looking. That's one of the photographs that I converted into black and white.
" I'm not a big fan of bats, having had more than one mistakenly get inside our house, though!" Yes, I bet they can be VERY scary if they get into a house. Thanks so much for stopping by, dear friend. Have a haunting good weekend! "I can confidently say you have a demonic presence about you in these photographs. I mean that as a compliment, of course." Hahahahahaha! I agree, I look quite DEMONIC! Thanks so much for stopping by, buddy. Have a grrrrrrrreat weekend! Ron, these are FABULOSO! Great photo editing! You keep getting more and more proficient in your photography skills. I love your red eyes in #'s 2 and 6. #3 is way cool and #7 looks a movie post for a horror film! But I think my favorite is the last one. Incredible! Loved the sounds effects too! I keep trying different things with my photography so that I learn more. Eventually I would like to get a version of Photo Shop so that I can learn and do more with my editing. However, now I just use several online photo editing websites. "#7 looks a movie post for a horror film!" HA! I never thought of that but you're right, it does kinda look like a movie poster. Thanks so much for stopping by, bud. Have a most excellent weekend! 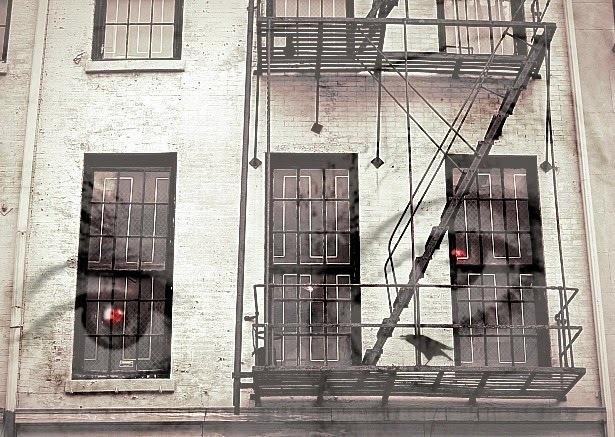 "kept looking for a face in one of the upper windows but No there he was peeping from over the top of the house, I guess Vampire Ron is a bigger guy that I thought ;)"
HA! I tried to position the face in various parts of each photograph. And in that particular photo my initial thoughts were to place it inside one of the windows, however, I couldn't get it to fit so I hid it within the tree branches. Thanks so much for stopping by, buddy. Have a fabulous weekend! These are very, very good Ron! 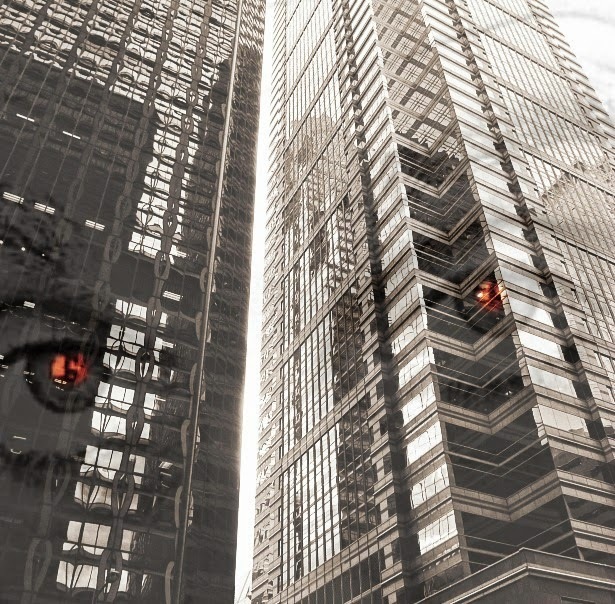 I especially love the one with your orange eyes against the steel/glass building! Very inventive & creative! Wow, Ron! What a cool, creative and spooky post! My husband Dave also loves Halloween, black, the macabre, all that stuff. We need to get together sometime in the next five years. Geez. When are we making that happen? Anyway, I love your creative eye (or should I say "eyes"?) I marvel at your talent and loved that you included sound/video to accompany your photos. The perfect touch that only you would think of. Happy Halloween early! I hope you get the crap scared out of you at some point during the day. I took that shot of the steel/glass building in the business area of Philadelphia last week. It's located on Market Street. Thanks a bunch for stopping by and catching up with my posts. You're a sweetheart. Have a super weekend! I had so much fun creating these photographs. Eventually, I would like to purchase a version of Photoshop so that I can do even more with editing. All of these I did on PicMonkey. Thanks, my friend :) I'm learning and more about photo editing the more I practice it. Eventually, I would like to purchase a version of Photoshop so that I add even more detail. I use mainly PicMonkey now and a few other online editing websites. "My husband Dave also loves Halloween, black, the macabre, all that stuff." " We need to get together sometime in the next five years. Geez. When are we making that happen?" Do you know what's funny? I was just thinking the same thing! I loved when you, Meleah and Val came into the city. Sometimes I get a day off during the weekend, so if you and Dave would like to come into Center City one weekend, let me know and perhaps it will work out that we could meet up. I actually have this entire weekend off (which is very rare), but that only happened because my manger had to change our schedules. Ooohhh, LOVE HALLOWEEN! HUGE bag of candy waiting on the table for next week's trick-or-treaters. We always get a lot of them! Awesome photos, great editing!!! The spooky music was a nice touch. I got such a wonderfully creepy feeling scanning down to see each photo while listening. YES!!!! Sooo interesting that I'm here NOW, because as I type this I am actually sitting in a costume I might wear for my daughter's party. We haven't actually decided to go as Ron's so busy today and he's not all that into dressing up (and costumes are strongly suggested) but I did throw something together just in case. Oh, but I better take it off now though as I have to go to the grocery store for a few things and they might get the wrong idea and kick me out. haha. If we go, you know I'll be posting photos later this weekend. "Ooohhh, LOVE HALLOWEEN! HUGE bag of candy waiting on the table for next week's trick-or-treaters. We always get a lot of them!" OMG, that's awesome, Mary! I hear from so many people that they rarely get trick-or-treaters anymore. And I guess because I live in a city, I don't see many myself. God, I miss the old days when trick-or-treating was such a big deal. Thank you, so glad you enjoyed the music and photographs :) I had fun putting this post together. "Sooo interesting that I'm here NOW, because as I type this I am actually sitting in a costume I might wear for my daughter's party." Oh, how funny! And yes, if you and Ron do go, please be sure to post photos on your blog because I will anxious to see them! Thanks much for stopping by, neighbor. Have a fantastic weekend. The weather is gorgeous! Ron, I love the Addams Family too. Several years ago I purchased the whole series on Amazon so that I could watch them over and over. What a great show that was. Oh, how faaaaaaaabulous! I will sometimes watch certain episodes on You Tube, but they don't have the whole series. Yes, what a great show that was. I liked The Munsters too, but I liked The Addams Family more. Very cool! Those are fun and spooky. I like how you also stuck the raven in the last one. I couldn't decide where I wanted to place the raven in that last shot. At one point I had it sitting on top of the lamp post. But then I started to play around with the different effects and found out that I could make it look like a shadow on the brick wall. Hope you're having a FAB weekend with your new lawn mower! Thanks so much for stopping by. "WHY are you showing me these right before I TRY to go to sleep????? Yikes!! I need to come back later ... when I am full awake and it is LIGHT outside!! :)"
HA! Yes, I'm creature of the night and LOVE all things Gothic. Hope you got some sleep, my friend. Thanks for stopping by! #4 could pass as "The House on Haunted Hill." It surely is that time of year for a visit...Halloween just wouldn't be Halloween without it. And is #8, the last one, a favorite? I seem to have seen this house before? in teal? making the knob of the door the crow's eye looking up at his master's'. LOL My imagination is running amuk...Esp. when I saw the moon hovering below. A wonderful effect. Ron, over the moon with you over the moon. You are Mr. Creativity. What a fabulous collection of spooky photos. I would rather have your eyes in the sky than government satellites and drones. I also love gothic stuff, vampires, etc. And there's nothing like the drama of a black and white or sepia photograph. Thanks for setting the tone for Halloween. i'm loving number 1. great photo ron. and i do love how you put your eyes in the photos. on another note, if i can't sleep tonight, i'm calling you. Thank you, Petra :) I've been trying new things with not only my photography but also with the editing process. It's been a great learning experience. 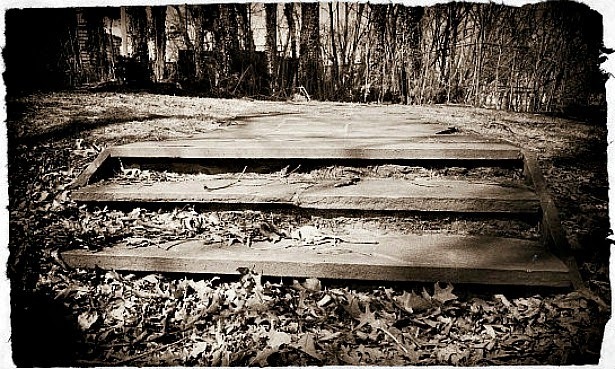 "#4 could pass as "The House on Haunted Hill."" HA! Yes, you're right, it could! That house is one of the many mansion-type homes in Chestnut Hill. It's a gorgeous area outside of the city which I visit often. In fact, today I took a train trip out there and had a very nice time. "And is #8, the last one, a favorite? I seem to have seen this house before? in teal?" Yup, that's one of the photographs I shared several months ago and used a sepia tone on it. It's a house that's not too far from where I live. Thanks so much for stopping by, my friend. Hope you're weekend was fantabulous! Thank you, Lauren :) I had so much fun editing these photographs. The more I practice, the more I keep learning. Photograph is one of those things that's all about trial and error and finding out what works. "I also love gothic stuff, vampires, etc. And there's nothing like the drama of a black and white or sepia photograph." You too? And you're right, there is nothing like the drama of black and white or sepia used in photographs and film. Some of my favorite films were shot in black and white because it added such a special feel to the movie. "Schindler's List" was one of them. Thanks Val :) #1 was a photograph I shared several months ago but decided to use it again because it looked very Gothic.
" on another note, if i can't sleep tonight, i'm calling you. HAHAHAHAHAHAHA! Sorry about that. Yes, call me if you can't sleep tonight! Much thanks for stopping by, girl. Hope your weekend was FAB! Yup, ya definitely have that deranged look about you. LOL. I wear that year 'round. Love the photos...it was like Where's Waldo on a few of them, but I'm pleased to report that I found you in every one. I'm ready!! 230 treat bags, giant spider and ghosties and all. Oh, we're missing the jack-o -lanterns! Wednesday's activity, methinks. There are six pumpkins all set for carving, so I think we're good!! "it was like Where's Waldo on a few of them." "I'm ready!! 230 treat bags, giant spider and ghosties and all. Oh, we're missing the jack-o -lanterns! Wednesday's activity, methinks. There are six pumpkins all set for carving, so I think we're good!!" Mel, I love that you get as excited about Halloween as I do. And I also love that you put so much joy and effort into getting everything prepared for your Trick-or-Treaters! I bet the love coming to your house! Thanks for stopping by, dear lady. Have a grrrreat week! Ha ha ha! I saw this at work first - just in an email and really enjoyed all the pictures. Now I am home and was able to be ON your site and really look at everything. I hit play for the sound and laughed through the whole thing. Holy cow that is SO SO SO funny the difference it makes. From really great to Hysterical Bust Your Gut funny and awesome and creepy and wonderful! Aw...thanks, Katherine :) I had a blast editing these photographs. One of these days I would like to upgrade to a version of Photoshop so that I can do more "fine tuning" with my photos. Yet, it's amazing what you can do with some of these free online editing websites. Have a terrific week, my friend, and thanks for stopping by!